Instagram has more prestige amongst younger social media users compared to Facebook. While Facebook is still holding strong amongst teens and millennials, it is no longer the most important social platform for younger users. 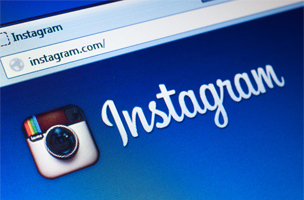 Instagram has greater prestige compared to Facebook and Twitter, according to a new BI Intelligence report. 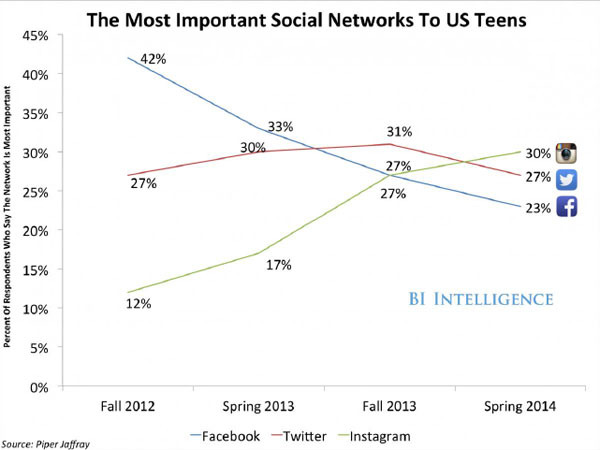 Since last fall, Twitter and Facebook have been declining in importance amongst teenage users. Instagram, however, has been growing in importance, surpassing Facebook last fall and Twitter earlier this year. Facebook still dominates in terms of usage, with 80 percent of 12- to 24-year-olds on the platform. Fifty-three percent of them reported having an Instagram account, and 46 percent have used Snapchat. Snapchat was followed by Twitter (36 percent), Google+ (34 percent) and Vine (30 percent). 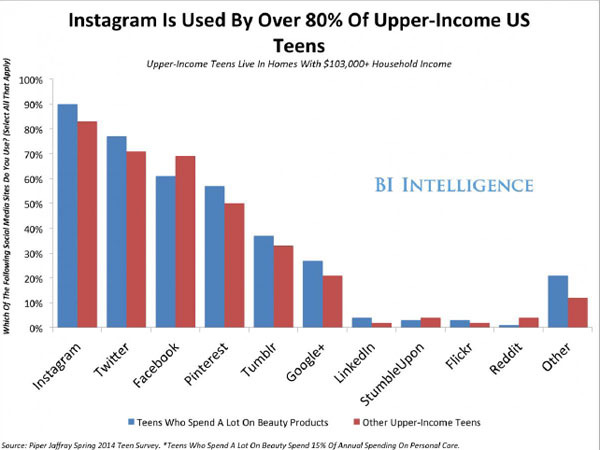 Instagram reached 83 percent penetration among upper-income teens, ahead of even Facebook. This makes the social network a particularly attractive marketing platform for youth-centric premium brands. Men are becoming more prominent on the photo-sharing platform. While women made up 68 percent of its user base last year, the gap has narrowed significantly. Men are also influential on the platform — six out of 10 Instagram users with more than 10,000 followers are men. The NFL, Red Bull and Monster Energy all have had success targeting men on Instagram.